While this project was completed some time ago, we thought it was about time to share some photos of the results. G Block of the Bay of Plenty Polytechnic is home for the automotive school. The refurbishment resulted in a building that specifically suits the needs of the automotive school students in regards to lighting, layout and use of floor space as well as location of all mechanical resources. The original building was a redundant space that wasn't used due to issues with the building envelope. The Creative Space design team addressed this and fitted the building out better for the automotive team including incorporating washing bays and parking space required for their projects. ICF blocks are very large format polystyrene blocks, comparable to traditional masonry blocks. 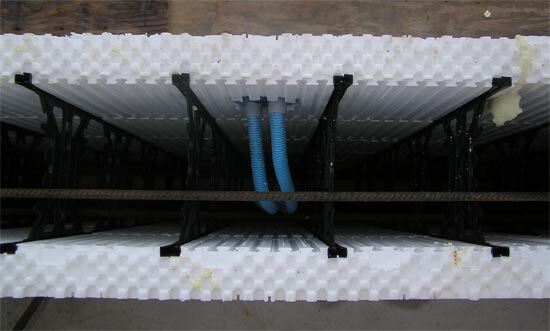 Due to the size of most ICF blocks, one block is equivalent to 4-6 traditional masonry blocks yet ten times lighter. The ICF blocks are simply locked into place and then braced before being filled with concrete (preferably a mix containing fly ash which is a by-product of the Huntly Power Station). This creates a reinforced concrete wall that is incredibly warm (with double the R values of traditional timber frames), incredibly strong and incredibly quiet. Read more here. We are looking for a high quality, building industry leader to give expert advice on design detail plus help lead our team of qualified architectural technicians. As our senior technical advisor, you will be comfortable consulting directly with clients on specific projects. Ideally you will have 10yrs+ building experience and be keen to learn new skills on-the-job. You’re receiving this newsletter because you’re a client of ours or have expressed interest in subscribing to our newsletter. If you wish to unsubscribe then you can do so by clicking here. Unsubscribe from this newsletter.